After finishing the Hell Hound, my attention turned to the Valkyrie. 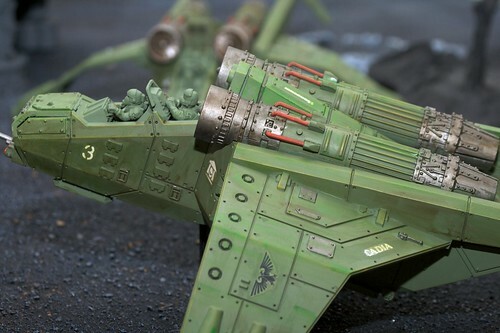 This was the model that turned my attention to the Imperial Guard in the first place. And, if you have read my Adepticon posts or have been to a large tournament in the last year you know that a lot of other people have started the IG for similar reasons. And for good reason, its a super sweet looking kit and the rules are awesome. Winner, winner, chicken dinner (as my grandmother would say!). Now for such a serious model, I wanted to try to some new stuff and generally end up with a nice looking model without spending forever on it. Enter in weathering. I grabbed my ideas from a number of blogs (mr justin, Mathieu Fontaine, and Ultrawerke). Traditionally, the GW hobbiest weathers with GW paints and possibly some of the weathering powders on the market. However, these blogs pointed to the historical hobbiest use of oil based paints to achieve the same results. With this you gain a couple of advantages over a traditional wash- its quicker, it retains a high surface tension so the oil 'wash' doesn't dive down deep into the shadows, and over the long term it is much cheaper. First off- I painted the model like normal. 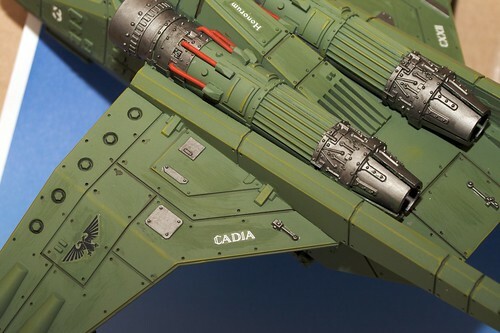 Then I added some highlights with hard lining and placed some decals to celebrate Cadia. Oh, I did two at a time. After a dose of Purity Seal the first oil wash was started. The local Hobby Lobby came through in a major way. I got several colors of Winsor & Newton Winton Oil Colours. They run about $6 per tube, and a tube will last you for several years, possibly longer. If you keep a close eye out, HL will offer special sales on their oil paints. I bought black, white, burnt umber, and the primary colors (red, blue, and yellow). With these colors you can make any other color out there using white and black to adjust the saturation. I got burnt umber just because that is a color I'll use a ton of. Next apply these colors in random areas with short strokes moving along the sides of the plane in a lateral motion. Then thin this down with a paint thinner. 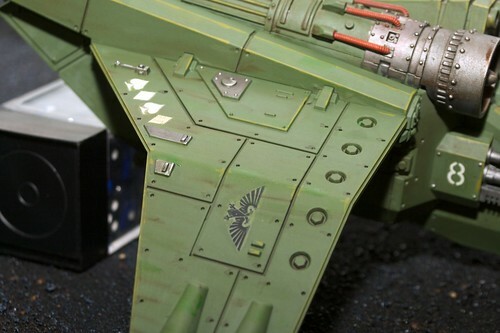 Using the thinner to get the opacity you want, and travel the brush in the direction you want your weathering. Have fun with this step! Warning- oil based paints take several DAYS to dry. I did one or two colors at a time, then applied another dose of Purity Seal to the models, then repeated the process. At this point some of the areas were done messily- no worries, there are more steps to come. My last step, at this time was to add Raw Sienna (same paint line as above) since the main ingredient is 'rust'. Thusly, this was my rust stage of the weathering, done in the same fashion as above. Obviously still WiP at this point. However, the main body is done. The flash on the camera picked up the lighter green oil paints more than you see in with the normal eye. Once those illusive Forge World Vendetta parts come in, I'll be able to convert over the Valks to the Vendetta. Very nice work so far! 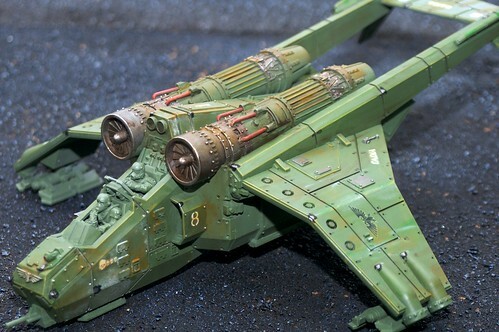 I like your choice for the weathering espeically, it really looks as though that Valk has seem some rough atmosphere in its time. 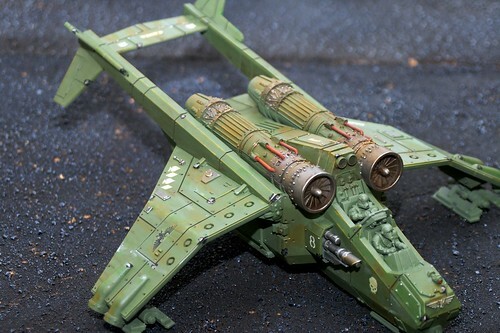 Thanks- I wanted to show a Valk that has been seeing some action but too torn up! The oil paints are fun to play with and can give some interesting results. In retrospect I wish I hadn't used so much of the light green, oh well. I'm really impressed with how quickly you've put into practice these new techniques... way to go! 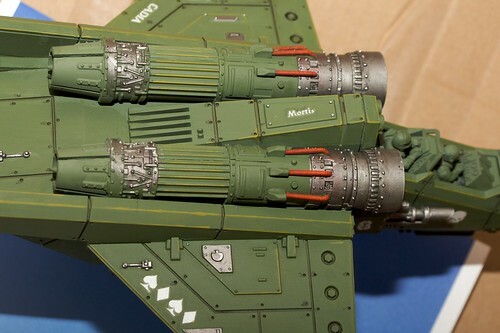 The weathering looks very good, I'm definitely going to refer back to this once I'm ready to try out oils for myself. Thanks! The oils were fun to work with, and fairly easy to get the hang of it. Mastering the technique of course will take some time. One thing- don't skip the Purity Seal step. Almost a week later, some of the colors can still be wiped off- seal that tank! 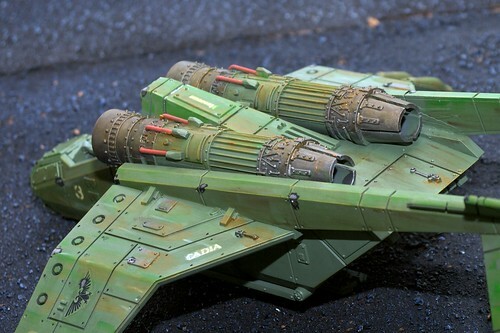 I also ordered some weathering pigments from Secret Weapon Games. I hope to get them soon and post some pictures.